Easiest way to immerse yourself in Mayan culture, right in the heart of Cancun. One of the most underrated adventures available in Cancun. El Rey was an important city that was abandoned once the Spanish have arrived. The entrance is free on Sundays and the other days only 50 Pesos per person. 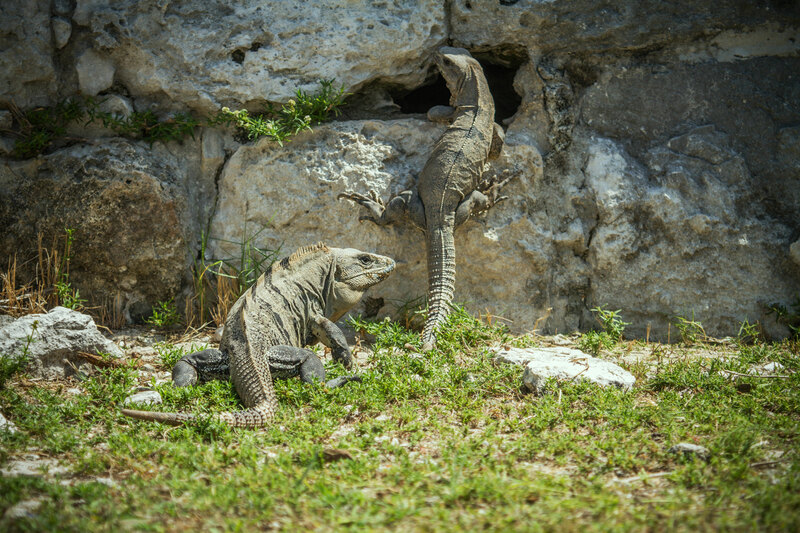 Bring fruits for the tame iguanas that call the ruins home. There is a huge colony of them living there. There is no shade though, so prepare to tackle the 47 ruins under scorching sun. One of the last “rediscovered” ruins and easily the best we had been to. 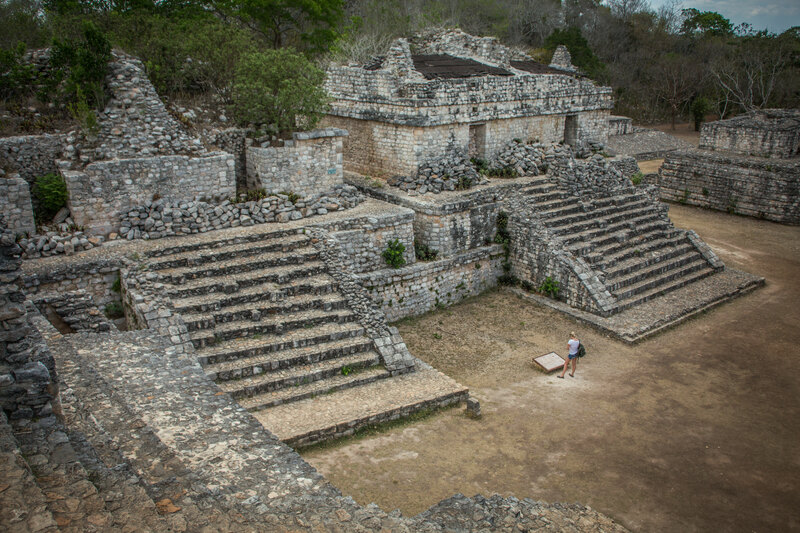 Ek Balam is not easy to get to from Cancun. 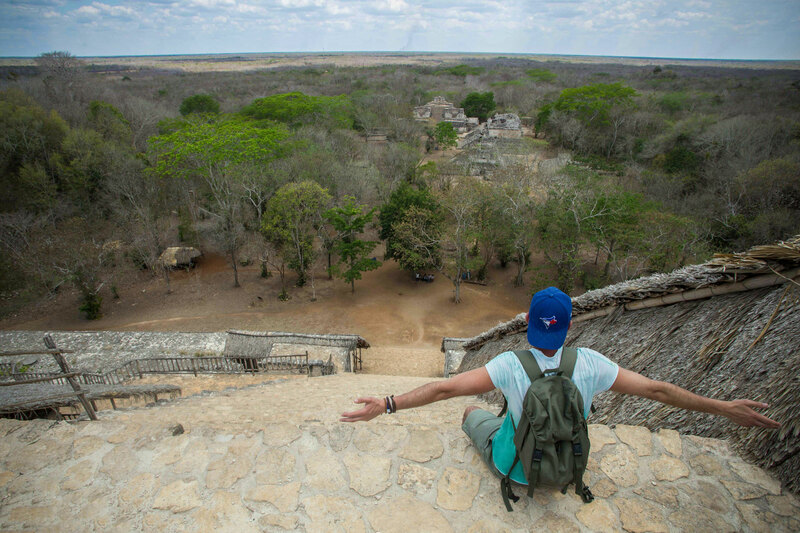 Most people flock to Chichen Itza and are oblivious to the wonder of Ek Balam. If you arrive in the morning, you are pretty much guaranteed to be alone in the vast city. The pyramid is called “El trono” “the Throne” and at the side, the king Ukit Kan Lek Tok has been buried. We were shocked to find out that majority of the structures have remained in such a good shape. 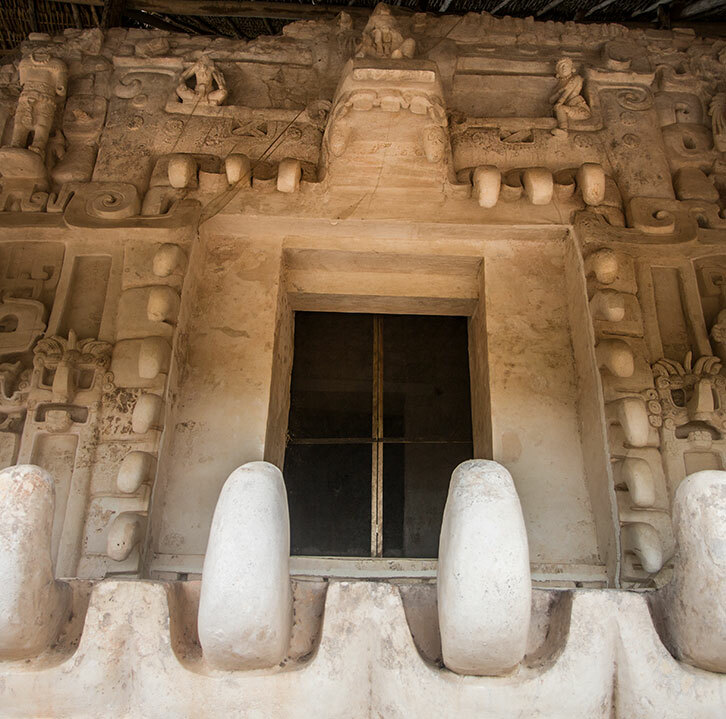 Imagine after seeing all this, realizing that only the center of Ek Balam had been excavated!! Second in recognition after Chitchen Itza, Tulum sees a never ending stream of tourists every day. 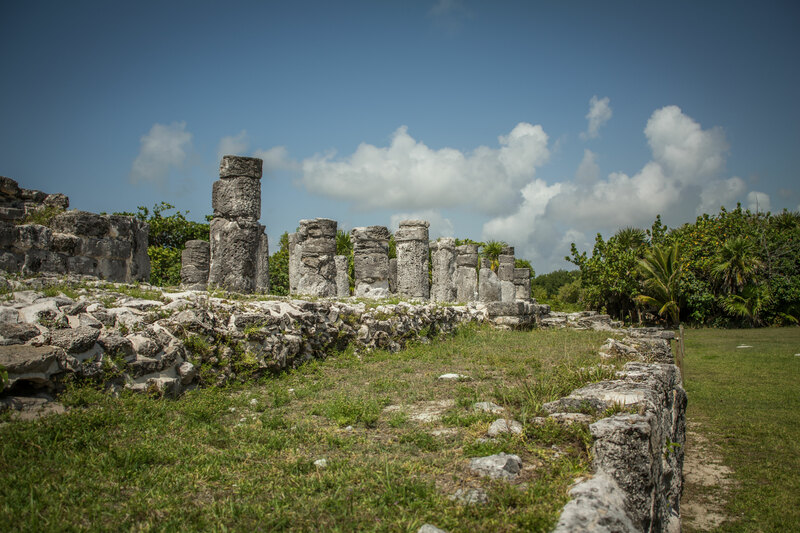 Conveniently located an hour away from Playa Del Carmen, these ruins are easy to visit. 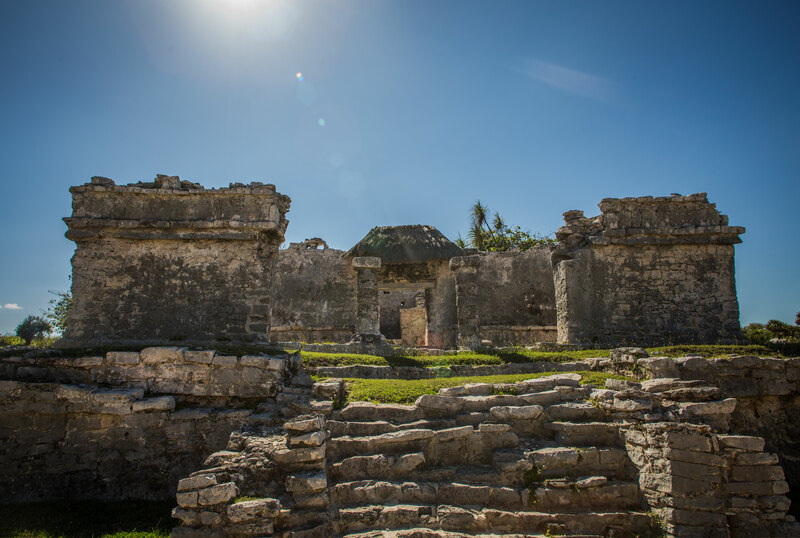 Tulum was a port city that belonged to Coba, and actually survived for some time once the friendly Spanish arrived. The biggest building is called “El Castillo” and is depicted on various tourist souvenirs. Prepare to be disappointed as climbing the steps is no longer permitted. The closest you can get to the facade, is where I was in the picture below. Bring a hat and lots of water as we labored getting to every building under the sun. 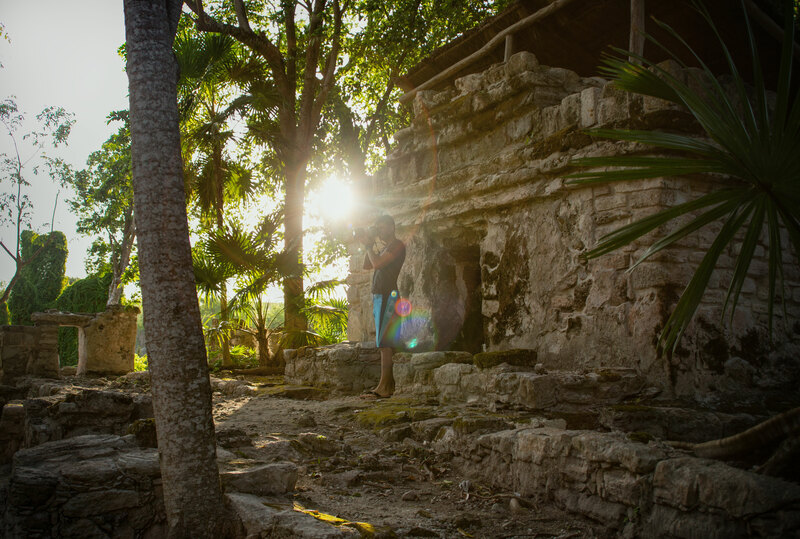 If you want to experience Tulum in relative peace, arrive as they open. 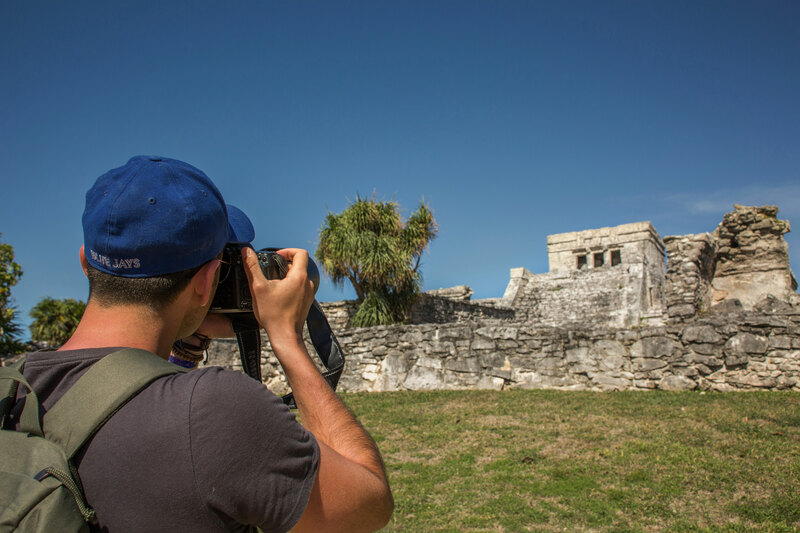 A half hour drive from Tulum is another Mayan city. Muyil is one of the earliest Mayan sites (350 BCE). We actually thought they were closed when we arrived as there was no one there. Muyil is located right in the jungle and lush vegetation, birds and sounds surround you as you explore. A very surreal experience. As soon as we got past the pay desk and started on the trail, the sounds of highway were drowned by the birds and insects. It is as if you stepped through a portal a thousand years back. Sadly, Muyil is a small site though. 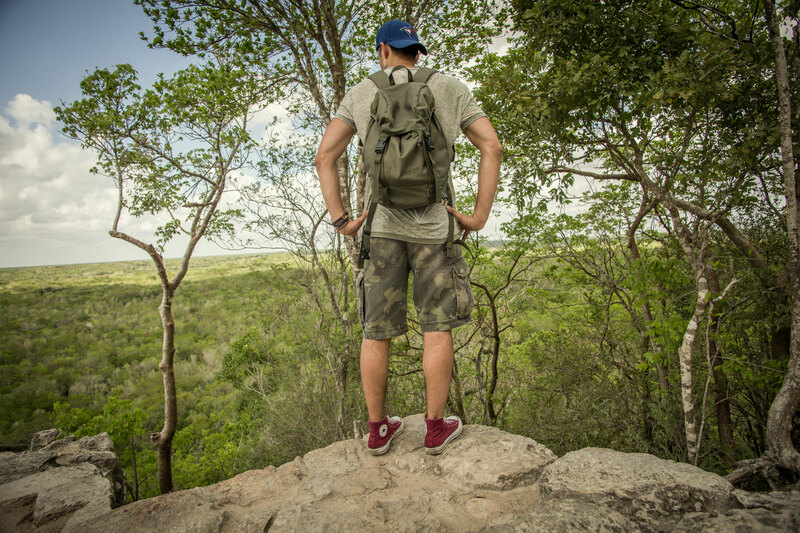 If you follow the path into the jungle, for additional 50 pesos, there is a hike into Sian Ka’an reserve available as well. Coba is awesome. How can you visit Mexico and omit Coba?? Apart from Ek Balam, I would most definitely return to Coba, over and over. There is such grandeur, mystery and massive grounds to explore that one visit is like watching a trailer and omitting the movie. You need a lot of time if you plan on exploring on foot, at least 3-4 hours to get around all the sites. There is another way though! 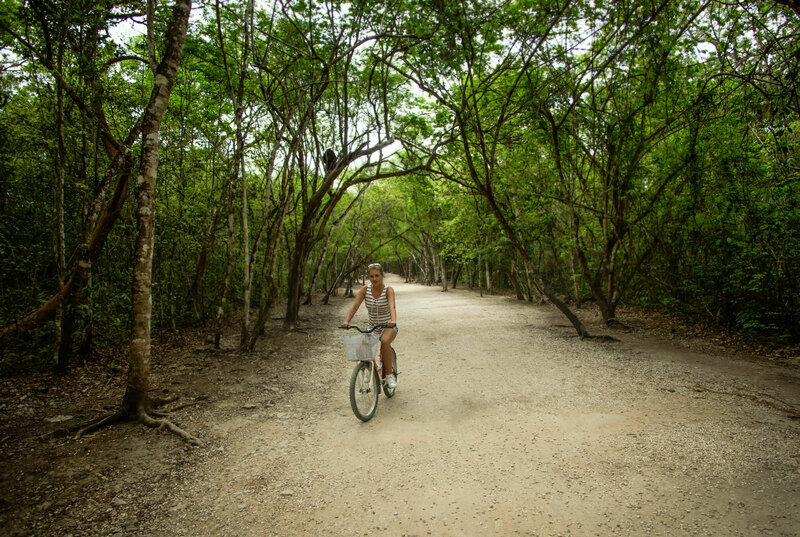 You can rent bikes right after the entrance gates and for 50 pesos per bike, the ancient city is yours to explore. Early morning is a fantastic time to run into wildlife as well. 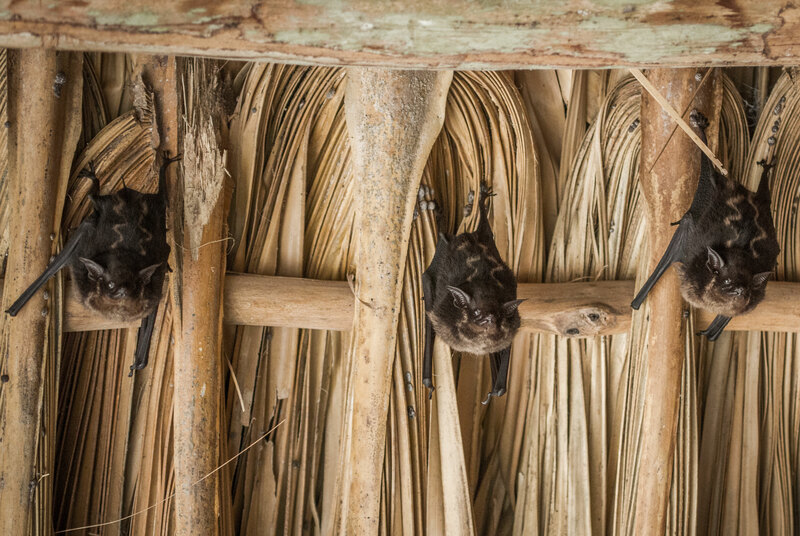 The temples and ruins are home to thousands of bats and they are very good subjects to photograph as they remain motionless. I must have taken a hundred of images of these cute little Draculas. We zipped past massive tour groups, and avoided huge delays. There is nothing you can do regarding the pyramid though. 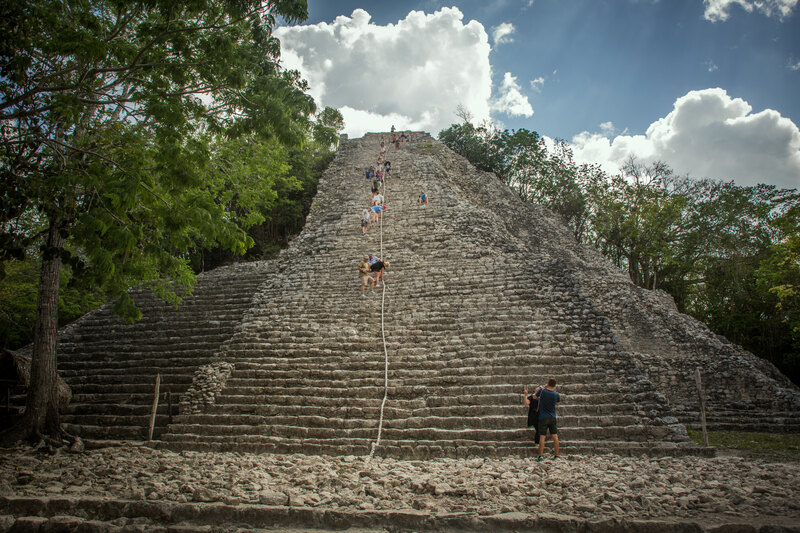 Thousands and thousands of tourists flock to Coba every day. Trying to climb to the top is the same as being stuck in Times Square in New York, you will be surrounded by slow moving and scared people that take ages to climb up and down. The best time to go there, is the minute they open. Run to get the bike and then pedal with all your might to the pyramid, and only then you will have roughly five minutes of the pyramid all to yourself. Trust us, it is worth it! 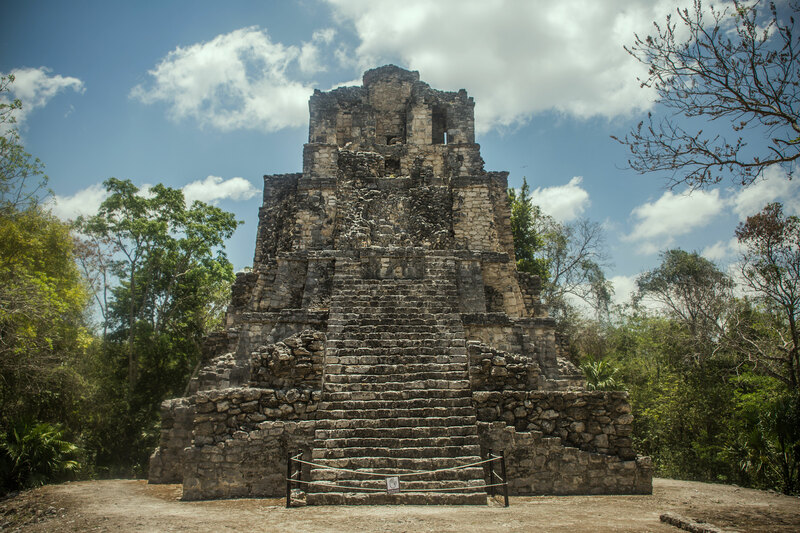 Some hotels are built on former Mayan cities and if you enamored with Maya, choose a hotel that has ruins and you can explore all day and every day. Occidental Xcaret is one such hotel and boasts nearly a dozen ruins to discover. Yucatan peninsula is peppered with remnants of Mayan civilization. It would take months to visit every discovered site and even then, you will feel that you have only scratched the surface.